Mabtools grinding wheels are designed and manufactured to provide the best results when used on steel, stainless steel, cast iron and stone. 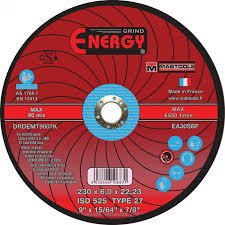 The energy range is designed to be flexible, paying special attention to materials and applications. The disks are produced with high quality European raw materials, corundum and silicon carbide, mixed with resin bonds and special fillers.